Under a vast sky providing endless days of sunshine, set against the dramatic backdrop of the soaring, snow capped peaks of the Anaconda Pintlers, is the stunning alpine body of water known as Georgetown Lake. At 6,425 feet above sea level, averaging 16 feet in depth, Georgetown Lake expands over 3700 acres. It is nestled within three mountain ranges; the Anaconda Pintlers to the South, the Sapphire Range to the West and the Flint Creek Range to the East. The closest municipalities are the historic mining towns of Anaconda, 14 miles to the East and Philipsburg 10 miles to the North. 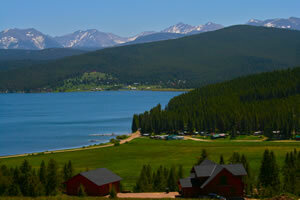 The Lake, encompassing both Deer Lodge and Granite Counties, was created in 1885 by damming N. Flint Creek. Originally used to produce power, the lake is now primarily used for outdoor recreation and to provide water to down valley ranchers. Winter, summer, spring and fall, Georgetown Lake has something for everyone all year long. The Lake is home to large populations of trophy sized rainbow and brook trout as well as large numbers of kokanee salmon. This blue ribbon fishery, along with some of the best ice fishing in the state, is rated Montana’s most prolific lake with more fish caught per person than any other lake in Montana. Large tracts of the Deer Lodge National Forest and other public land provide prime habitat for abundant wildlife and big game. This, along with a myriad of nearby rivers, streams, creeks and mountain lakes, trail systems that extend hundreds of miles, challenging Discovery Ski Mountain, 3 nearby golf courses including top-rated, Jack Nicklaus designed, Old Works Golf Course, make the Georgetown Lake area a recreational paradise and one of the most beautiful places in the country. It is also the perfect family getaway. Leave the computer and video games behind and watch your kids catch their first fish, scream with delight as they come across a moose 4-wheeling to a remote mountain lake, help you build a fire for your camp side dinner, conquer the moguls on a snow board, take to the air kite boarding or quietly watch a grazing herd of elk. Georgetown Lake will create the memories that will last a lifetime.